GOODFUNDSADVISOR: VRL LOGISTICS IPO - SHOULD YOU INVEST? VRL LOGISTICS IPO - SHOULD YOU INVEST? Hubli based VRL Logistics is coming out with an initial public offer (IPO) with a price band of Rs.195 to Rs.205 from 15th April to 17th April. This IPO which is expected to raise about Rs.451 crores to Rs.468 crores will be used by the Company to acquire New Fleet, repay debts and rest on General Corporate Purposes. The issue will also give an exit to PE player New Silk Route and also by Promoters. Post IPO, promoters stake would be reduced to 70 per cent and 25 per cent would be held by public and the rest 5 per cent would be held by investors," said VRL Logistics Chairman and Managing Director Vijay Shankeshwar. VRL Logistics Ltd owns nearly 3,546 out of its fleet of 4000 vehicles. VRL is present in 970 locations pan India which is huge. The Company’s primary revenue is from Goods Transportation contributing 75% to the total revenue. 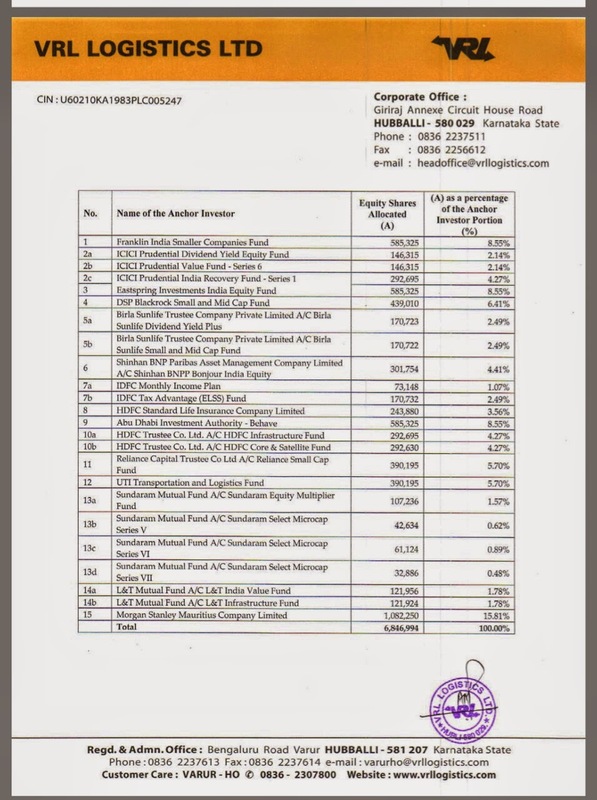 For 9 month period ended 31st Dec 2014, the Company posted a Net Profit of Rs.71.69 crores on revenue of Rs.1279 crores. VRL Logists is one of the Leading Players in Indian Freight Transportation sector. It has a huge network of 859 branches, 44 transhipment hubs and an envinable fleet of 2,573 tructs. Crisil expects the Logists Parcel industry to grow at 11%. 1. With the Indian economy on an upswing, companies like VRL Logistcs are in a sound position to take maximum benefit. 2. Due to its in-build Bus Building plant, VRL Logistics buses has 10% to 15% EXTRA carrying capacity thus contributing to the bottomline with same outgo. 3. The Company also directly buys Gasoline from Refineries and has its own Diesel Bunk in Huballi and Chitradurga. This has resulted in direct saving of Rs3 per litre!! Crisil has given a rating of 3/5 indicating AVERAGE. VRL Logistics, in the past, has a liking for taking Debt to fund its expansion programmes which if repeated, could affect its bottom-line. With Crude prices on a decline and expected to stay weak for quite some time, the biggest expense for Company is taken care of and should help the Profit Margins of the company. VRL Logistics could well be a GATI or a TCI in the making. With a good number of quality QIB investors showing faith in the IPO…….I would advice to invest at Cut-off for the intial pop up gain. Not exactly comparable, but GATI’s PE is 84 and TCI’s PE is 26........thus VRL Logistics at Rs.205 gives a PE ratio of 20 on a Dec EPS of 7.21. Considering cheap valuations and strong foothold in Southern India, we recommend "Subscribe", says KRChoksey research report.